David and Marlowe Klitzky started The Great Frame Up art and picture framing stores in 1971, bringing the joy of art to the Chicago area for over 35 years. Beginning with the original store on North Broadway in the heart of what is now the Lakeview neighborhood, David and Marlowe founded The Great Frame Up on the unique theory that if customers were allowed to save money and “be part of the art”, it would not only enhance their buying experience but would also increase appreciation for each finished piece. 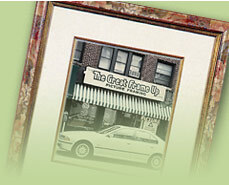 Hence, The Great Frame Up was the first art and picture framing store of its type to offer Do-It-Yourself framing to their customers. They continue to offer this “fast, fun and frugal” service today at all seven of our locations (see Store Locations section for complete detail).